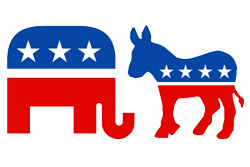 The recent live broadcast of the national Democratic and Republican Conventions demonstrated ever-changing workflows that required high-quality flexible systems and a unified interface to record and manage a plethora of obtained assets including images and video clips provided from a variety of sources to be used on stage. Success was reached through technologies that allowed for superior organization and limitless versatility of the end-to-end content creation and distribution. The Democratic and Republican National Conventions that aired live this summer from Philadelphia, PA and Cleveland, OH elected Pronology and its cutting-edge tapeless workflow solutions, CenterPoint™ and mRes™, to help manage tens of thousands of assets and record multiple streams of content. At the Republican National Convention (RNC), the CenterPoint™ and mRes™ systems were placed directly into the server racks within the venue’s machine rooms next to the in-venue storage with house technicians providing power and video feeds. At the Democratic National Conventions (DNC), the mRes™ system was installed in a mobile unit for the DNC. The primary challenges faced during the broadcasts were the ever-evolving workflows. During initial setup, large portions of the workflows were inverted to make things easier for the graphics departments. Another challenge was how best to streamline the use of image metadata since it varied depending on the provider. Pronology’s uniquely flexible workflow engine within the CenterPoint Media Asset Management (MAM) system was designed to simplify the daily tasks of end-to-end content creation and distribution. This feature was utilized at the RNC to tag and organize tens of thousands of images and video clips used on stage. The production team and directors had the freedom to view both images and video through one interface to determine which on-screen images to show during a production that had very little turnaround time, all the while being able to download, edit and re-import any images in an organized and traceable way. CenterPoint solved these challenges because it allowed for a limitless number of users to simultaneously, remotely and securely acquire, manage, approve, log, distribute, transcode and archive content using a standard web browser, significantly streamlining the process. The system’s user-friendly interface accommodated a wide range of possible workflows that could potentially be presented during the fast-paced broadcast, allowing versatility and flexibility for the production team. Additionally, the production team didn’t have to determine the entire set of images they wanted to use ahead of time. Without CenterPoint they would have had to purchase rights to all their images and set their on-screen image use ahead of time, which would make them inflexible if a speech changed or speaker was replaced at the last minute. The teams also deployed mRes, a standalone, multi-resolution encoder (controlled by CenterPoint) that seamlessly records three tiers of uncompressed video per SDI input channel: a high-resolution media file, an edit proxy and a live web-streamable proxy, for both the RNC and DNC. For each convention, the proxy video was used as a reference to associate the images with the appropriate rights holders for compensation. By using the mRes™ integration, the teams gained the ability to control encoding directly, as well as the ability to go back into the loop and recreate any media. One of the unique features of mRes™ is its uncompressed recording architecture. Because each copy is created from the original uncompressed loop, mRes™ provides various file formats without any loss of quality or signal degradation. This proved useful for the production team; they had instantaneous access to the content they needed, in any of the popular compression formats, without ever affecting the original media. The Pronology systems proved to be beneficial components of the Republican and Democratic National Conventions because they provided the production crews superior flexibility behind the scenes at these high-profile live events by giving them the ability to change the workflow at a moment’s notice in an environment with zero turn-around time. With CenterPoint’s streamlined interface and plethora of unique features, the production crews could preemptively prepare the images that were to be shown on stage in the event that a speaker be replaced or a speech be changed. When paired with mRes, three file formats were captured of the recording allowing the production team to access the content they needed instantaneously without affecting the original uncompressed file. Overall, Pronology’s technologies aided in seamless media asset management and recording for both of the live productions and solved a number of challenges that could have otherwise been showstoppers.